Santamaria bed and Breakfast v Pereira, Colombia: Zarezervujte nyní! Beautiful country house in the heart of the coffee region of Colombia, surrounded by coffee plantations, with spectacular view of the Andes mountains and strategically located. Ideal for bird watching, relaxing or get work done in this peaceful environment. Public transportation 1km away and very easy to get to the city and to the mayor attractions and parks that the coffee axis has to offer. We offer tourist information and also packages to the Coffee park, Hot Spring Waters, Salento and Cocora Valley, Ukumari Park, Los Nevados National Park (three of the glaciers left in the country) etc. Just 10 minutes from the Bus terminal and 15 minutes from Pereira Downtown, Via Pereira Armenia, 20 minutes from Pereira Airport. We offer pick up service at the airport or bus terminal for a very fair charge. 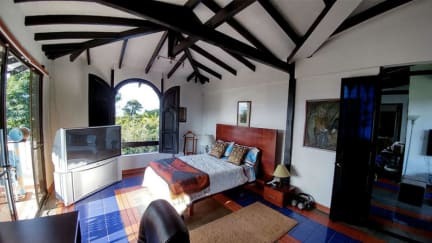 Very comfortable bedrooms, cable TV and free WiFi all around the property, free parking too and very comfortable mattresses.Some of the rooms have a covered deck with a breathtaking view. Breakfast not included - 12.000 COP per person. Christmas Eve and New years eve , Holy Thursday and Holy Friday, August 15th to 31st Fiestas de la Cosecha Event.